Spotify launches integrated apps including The Guardian, Last.fm and SongKick | What Hi-Fi? 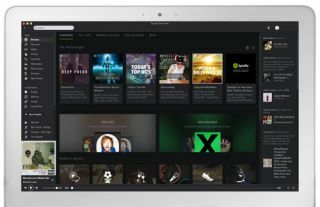 Spotify has announced the 1st generation of apps to be integrated within the Spotify dekstop application. Spotify Platform allows third-party developers to build apps within Spotify for the first time. The 1st-generation of partners includes Last.fm, The Guardian, Pitchfork, Rolling Stone, SongKick and TuneWiki. The apps will bring content such as reviews, in the case of The Guardian, links to live gigs with SongKick and your detailed listening history, via Last.fm. An App Finder will allow you to search for apps within Spotify. The new version of Spotify will be available imminently to download in beta mode, with the full release coming through a free software update in around a week's time. Also new are improved social functions, allowing you to more easily see and play what your friends are listening to, and better share your own Spotify playlists. The news, which leaked earlier today - see original story below - aims to open up Spotify to third-party developers and add greater functionality. All the apps at launch will be available for all users, not just Premium subscribers, though CEO Daniel Ek didn't rule out paid-for apps in future. The full list of Spotify Apps global partners is: Billboard, Fuse, The Guardian, Last.fm, Moodagent, Pitchfork, Rolling Stone, ShareMyPlaylists, Songkick, Soundrop, Top10 TuneWiki, We Are Hunted. Spotify is poised to announce a "new direction" for the company tonight, and we'll be live from the UK press event. Rumours abound that the announcement will see Spotify opening-up to third-party app developers, who will be able to build apps that use Spotify's music library. The crucial change would be that app developers would be allowed to sell their apps – this wasn't previously allowed, which made developing apps somewhat less attractive. Now developers could build apps on top of platform and sell them on iTunes or Android Market. This would see Spotify become more than just a music streaming service but potentially a platform for much more interaction. We'll be live at the event, which is due to start at 5pm, so follow us on Twitter or Facebook for live updates or check whathifi.com for all the details.